I'm back! I've been unable to access my Blog and my Facebook this last while because of a major computer booboo. Our main computer was toast. We now have a new computer and we're gradually getting everything up and running again. 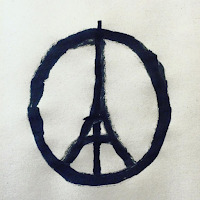 I am most distressed about the weekend terrorist attacks in Paris! Cowards attempted to kill thousands of innocent Parisians along with many tourists out for a pleasant Friday evening in the "City of Lights". We now find out they were only partially successful! Security personnel stopped one terrorist as he tried to enter a soccer stadium with over 50,000 spectators present! When discovered, the coward blew himself up at the entrance. Others escaped through the back door of a theatre under siege, saving their lives. Over 100 others in the theatre were not so fortunate! Convince Prime Minister Trudeau to slow down his plan to bring in 25,000 Syrian refugees into Canada over the next six weeks. Reports are saying that one of the terrorists in Paris arrived in France disguised as a Syrian refugee. Canada should send temporary relief to the refugee camps now, then bring in the refugees only after they have been thoroughly checked out by our security systems here. Convince Prime Minister Trudeau to leave our small RCAF contingent in Iraq to continue their fight with ISIS who have now claimed responsibility for the terrorism in Paris. I think pulling them out now would be seen as a sign of cowardice. Support groups trying to help refugees settle here in Canada. After all, most of us are descendants of others looking for a better and peaceful life here in Canada. Now it's time to pass it on! Show our support for the people of France through this horrible time in their history in any way we can. We must realise that these cowards who declared war on France Friday represent only a very, very small percentage of Muslims and/or Syrians. We must always keep that in mind! "Convince Prime Minister Trudeau to slow down his plan to bring in 25,000 Syrian refugees into Canada over the next six weeks. Reports are saying that one of the terrorists in Paris arrived in France disguised as a Syrian refugee. Canada should send temporary relief to the refugee camps now, then bring in the refugees only after they have been thoroughly checked out by our security systems here." It turns out the attackers were all European nationals. None of them were actually Syrian refugees. There has been speculation that the false papers dropped at the Bataclan Theatre attack was done purposely, in order to provoke backlash against Syrian refugees. Exactly like you're proposing. I also don't know why accepting 25,000 refugees in the next few months is so impossible while doing all the appropriate security checks. Toronto Pearson Airport handles over 50,000 international passengers a day - nearly 23 million per year! - with all of its security screening. "Convince Prime Minister Trudeau to leave our small RCAF contingent in Iraq to continue their fight with ISIS who have now claimed responsibility for the terrorism in Paris. I think pulling them out now would be seen as a sign of cowardice." I think having a token force in Iraq and Syria - the Canadian CF-18s are making less than 1% of the total sorties flown - at the cost of $50 million dollars a month isn't the best thing Canada could be doing. The Americans, French and Russians are much more keen to conduct air strikes (albeit for differing reasons), and have much larger contingents in the region - plus better ability to support them. Since Korea, we have not been a war-fighting nation in this sense, anyway. Our strengths are elsewhere. I think it's also important to state that withdrawing the Canadian contingent from airstrikes was a specific promise made by Justin Trudeau and the Liberals during the election. They won the election, so they have a clear mandate to follow through with this promise. What's With Alberta's Bill 6? What's Good For The Goose!